Guaranteed Asset Protection (GAP) is a great way to protect your finances if the value of your vehicle is less than the amount of your car loan. A good rule of thumb is to assume your new vehicle will lose on average 19% the first year you own it, half of which occurs immediately after taking possession. * This leaves a “gap” between what you owe on your loan and the value of your vehicle. In the event of a total loss due to an accident or theft, GAP is designed to cancel the difference between what you owe on your loan and the amount paid by your primary auto insurer. 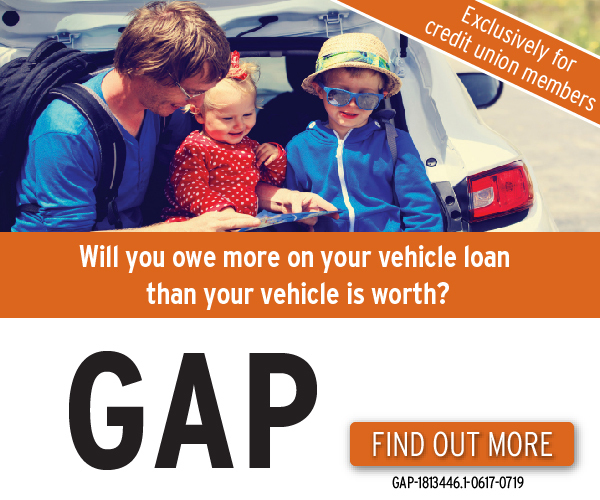 Call us today at 459-5970 to learn more about how you can add GAP with Deductible Assistance to your vehicle loan. Easily roll into your auto loan; you won’t notice the difference. "Hi A., I just wanted to take a moment to thank you again for helping me get my truck fixed. I fly down this Saturday to get it and drive it home." conditions, and exclusions may apply. You will receive the contract before you are required to pay for GAP. You should carefully read the contract for a full explanation of the terms. If you choose GAP, adding the GAP fee to your loan amount will increase the cost of GAP. You may cancel GAP at any time. If you cancel GAP within 90 days you will receive a full refund of any fee paid. What is GAP available for? Do I have to purchase GAP? Your purchase of GAP is optional. Whether or not you purchase GAP will not affect your application for credit or the terms of any existing credit agreement you have with us.